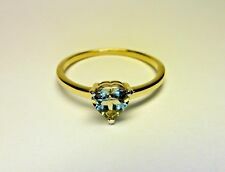 This is such a beautiful 10K yellow gold ring set with one of rarest gemstones found on this planet! 10000 rare than Diamond! Beautiful design, colors and sparkle top. Marked 10K gold in shank. Composition: solid 10K yellow gold. Ring Size：6.5. Width Bottom：1.1mm. Width Top：5.9mm. Service you wholeheartedly. You will get response within 24 hours. we are very glad to help you. Stamped：10K/417. Clarity：Flawless. This wonderful estate ring features a gorgeous princess cut topaz stone bezel set in solid 14k yellow gold. Topaz: 5 mm = approx. 0.75 carats. 14K Yellow Gold (marked & tested). All of our diamonds are genuine and none of our gold is plated (unless otherwise noted). This is so I can use this setting to display several opals or change to gold if you like. 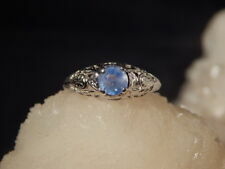 Prongs will be sanded down to size and the Opal will be set once item is paid for and I know your ring size. The total carat weight is. 82 carats. The color is green. The back of the shank is 1.5 mm in width and is adjustable. The top of the ring is set with 4 prongs and sets 6.5 mm above the finger. This ring is size 6 and can be sized to fit you. This is a ladies. 78 ct. round Cornflower Blue Sapphire gemstone ring. This stone possesses the scintillation effect, that is it twinkles when the sun or other bring light is cast upon it. This is like what Diamonds do also. A note about opal photography. I try to make the best and most realistic photos of opals that I can; however, opals are notoriously difficult to photograph as the play of color changes with lighting and with the stone’s orientation to the light source. This is a ladies. 82 ct. round cabochon Ethiopian Opal ring. The Opal is 8 mm x 8 mm. The total carat weight is. 82 carats. The color is rainbow with flashes of green, yellow, and orange. The back of the shank is 1 mm in width. An alluring Ring made of Sterling Silver featuring one 7mm Cushion (0.75cts) of adorable Ethiopian Opal from Ethiopia. You will truly be impressed by the he beautiful color and clarity. Size 9 0.75ct Ethiopian Opal Sterling Silver Aryonna Ring. Stunning 10K Solid Rose Gold Ring. Oval Precious Topaz. Beautiful Golden Peach Color. This gem was picked especially for this mounting (made in the USA) and set by expert local goldsmiths. Ring Size 7.25. Solid 14k Yellow Gold Ring prong set with one Solid Australian Opal. This is so I can use this setting to display several opals or change to White gold if you like. Prongs will be filed down to size and the Opal will be set once I know your ring size. This is a ladies. 91 ct. cushion Tsavorite Garnet gemstone ring. This is a gem quality natural Tsavorite stone in a 14k yellow gold spider web style setting. This ring was hand-crafted in the USA by our staff gemologist and jeweler. Prongs will be filed down to size and the Opal will be set once I know your ring size. Regards Kent. Solid Sterling Silver Ring prong set with one Solid Australian Opal. This Black Opal from Lightning Ridge, Australia is 100% Natural and not a doublet or triplet! Ring could be resized, but we don't resize rings. Gorgeous light blue topaz with hardly any inclusions and only slight feathering under a 10x loop. Very bright diamonds! Diamond total carat weight. 02. Gemstones: 100% Natural earth-mined opal, 8x6mm. 80 carat. This is a100% natural Australian opal, set into solid sterling. (Opal factoid: Due to the wavelengths of color, if an opal can display the. ). 10kt Yellow Gold. Gold Purity & Color. Flawless / Green. We have fine jewelry that will fit every. If the number is not on the label the box will be refused. order and advise the problem. ones price range. Cushion Cut Spinel. Beautiful Pinkish Red Color. Stunning Solid 14K White Gold Solitaire Ring. Clean VS Clarity (Type II). Natural Earth Mined from Tanzania. Four Prong Type Setting. Gold Weight: 2.35 g.
Solid Opal inlaid ed in solid sterling silver. This Solid Dark Crystal Opal from Lightning Ridge, Australia is 100% Natural and not doublet or triplet. OPAL WEIGHT: Approx. 80 cwt. Opal is Bright and Color is Crisp and Sharp at arms length. Natural Earth Mined from Tanzania. Amazing Solid Silver Sapphire Solitaire Ring. Six Prong Type Setting. Clean VS Clarity. Gold Weight: 2.14 g. Very Good Finish and Proportions. This is a ladies. 85 ct. oval cabochon Opal ring. This is a gem quality natural Opal in a sterling silver filigree setting. This ring was hand-crafted in the USA by our staff gemologist and jeweler. Presented is a lovely Sterling Silver. 85ct Oval Faceted Yellow Sapphire Solitaire Filigree Ring.85. There is one. 85ct. oval faceted cut natural yellow Sapphire solitaire. Sterling Silver. 85ct Oval Faceted Yellow Sapphire Solitaire Filigree Ring. This Pretty 10k Gold Solitaire Ring is a size 7.75. Sorry for the inconveince, I do not resize rings. The ring is 9.4mm at its tallest height with a total weight of 1.9 grams. About Gold & Silver Dreams. This is so I can use this setting to display several opals or change to gold if you like. Prongs will be filed down to size and the Opal will be set once item is paid for and I know your ring size. SOLID 14K YELLOW GOLD. COLOR / CLARITY. BAND WIDTH. SHAPE / CUT. RING SIZE : 7. TOTAL RING WEIGHT. MARQUISE CUT - APPROX. This lovely Opal ring is suitable for all occasions. The ring is currently a size 6.25, but can be sized to fit by our jeweler for free. Rings may appear to be larger than they are due to zoom technology. This is a very attractive natural sapphire, dark blue, oval faceted, 5 x 7 mm. 95 CT set in a size 7 sterling silver band with a braid design. GRACE BE WITH YOU. It is VS in clarity. The single shank filigree setting is Sterling Silver. Hallmarked "925" inside the band. Rings may appear to be larger than they are due to zoom technology. This is a strong and well made ring. For your consideration, a lovely heirloom 925 Sterling Silver Round Faceted Opal Filigree Ring In 925 Sterling Silver. It is VS in clarity. This opal features five colors, which is very rare. The stone is faceted to showcase the maximum amount of light, with five colors flashing at every angle. .75 TCW OVAL. SOLITIARE RING. 10K YELLOW GOLD. DIAMOND ACCENTS. HEIGHT: 6 MM. Setting：Pave Setting. ★Center Stone：100% Genuine Blue Topaz. Shape：Round. Ring Size：6.5. Color：Sky Blue. Width Bottom：1.3mm. Width Top：7.3mm. You may also like. For your consideration, this is a lovely. 86 Ct. Round Purple Tanzanite Filigree Ring set in Sterling Silver. There is one. 86ct. round faceted natural earth mined Tanzanite. It is VS in clarity. Tourmaline is very well known in its pink variety. Here's a greenish-blue one with the quality we look for, but seldom find. 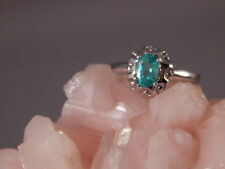 Blue Tourmaline is known in the trade as Indicolite Tourmaline. The actual color may vary from what you see here because of different computer settings.